Donington Park, UK; Sun 24th Apr 2011: Protyre Formula Renault BARC Championship rookie Zaamin Jaffer made a strong start to the 2011 season at Donington Park today, Sunday, 24th July, by just missing out on a top six finish on his racing debut in a ‘slicks and wings’ car. Taking seventh place in round one, a gain of two positions on his grid slot, the 21-year-old Indian born racer was on course for an eighth place finish at least in round two but contact from a rival, and subsequent puncture, spoiled his hopes two laps from the finish. Zaamin, who resides in Dubai when not racing or studying in the UK, concluded the first weekend of the 12-race championship 11th in the driver standings and is confident there is much more to come during the next event at Brands Hatch in Kent three weeks from now. Qualifying did indeed prove to be the most decisive part of the weekend for Zaamin. Running very strongly in the round one session, and sitting atop the timing screens during the early stages, traffic issues during the second half resulted in a relatively unrepresentative ninth fastest time. In round two qualifying, the Hillspeed driver ended the run 12th quickest. Zaamin made a decent start to the season-opening race and having avoided an incident at Schwantz Curve on lap one he headed into the second tour on the edge of the top 10, eager to make up as much ground as possible. Quickly moving up into ninth and then into seventh by lap four, the Formula Ford graduate spent the second half of the race trying to close down the gap to the top six runners having made terrific early progress. Taking the flag on lap 14 in seventh place, he thankfully survived a late-race scare when rival Matt Mason attempted a do-or-die pass at the chicane. In round two, Zaamin – who is sponsored by Dubai-based Active PR – moved up from 12th into the top 10 by the end of the opening lap and although slipping to 11th prior to a two lap Safety Car period he soon moved back up the order. Holding ninth position at the halfway point, Zaamin moved up into the top eight again but contact to his rear tyre at the end of lap 14 resulted in an excursion and a puncture. Although dropping to 14th position at the finish, he was at least able to make it round the final couple of laps to secure some additional championship points which could be crucial come the end of the season. Zaamin now has a three week break from motor racing action ahead of rounds three and four of the 2011 season at Brands Hatch Indy Circuit in Kent over the weekend 14th/15th May. 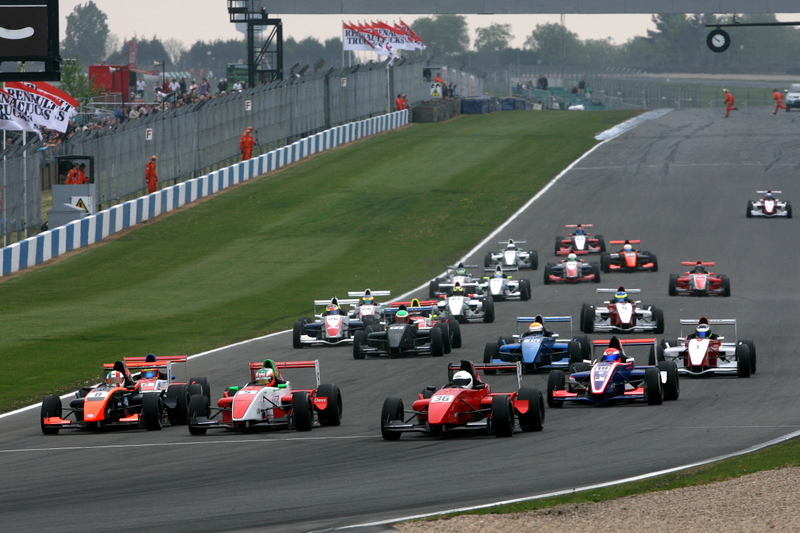 James Thorp (Evesham, Worcestershire) and Josh Webster (Stowmarket, Suffolk) took a win apiece at Donington Park today, Sunday, 24th April, during a truly exciting season-opener to the 2011 Protyre Formula Renault BARC Championship. Running as a key support category on the bill of the Renault Trucks-sponsored British Truck Grand Prix, the aspiring Formula One drivers from Formula Renault BARC delivered some fabulous race action to the thousands of spectators in attendance with Thorp emerging as the early series leader. His debut victory in round two, off the back of a strong second place in the opening encounter, has given the 18-year-old MTech Lite racer a 13 point lead in the standings over the surprise package of the weekend, RPD Motorsport’s Steven Durrant (Oxford). The 2009 Privateer Cup Champion enjoyed by far his most successful weekend since graduating to car racing in 2007, a maiden podium finish in round one followed by an inspired fourth place in round two – from a lowly 15th on the grid after gearbox problems in qualifying. In total, five different drivers appeared on the podium with Webster’s Fortec team-mates Kieran Vernon (West Chiltington, West Sussex) and Archie Hamilton (Hook, Hampshire) finishing second and third respectively in round two following a titanic battle. During qualifying on Saturday, 24thApril, Antel Motorsport’s Dino Zamparelli (Bristol) took first blood in the round one session with a pole position lap of 1m107.599 seconds (105.39mph). 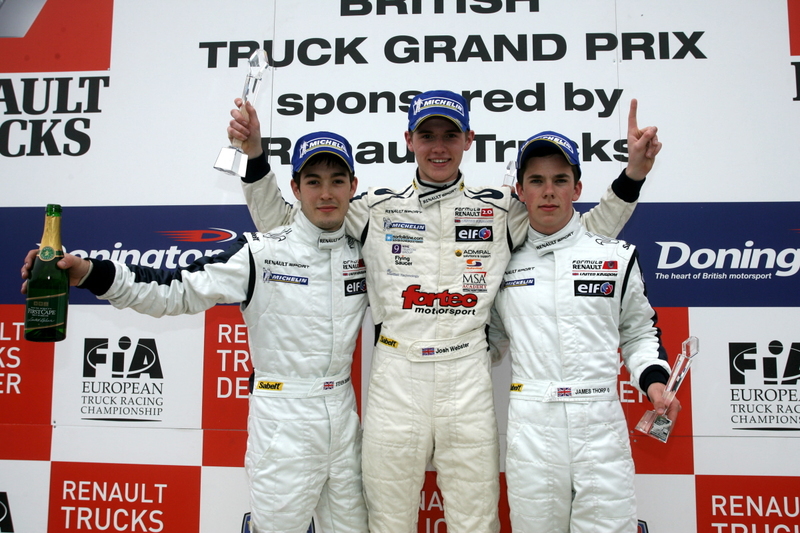 Hamilton and Webster qualified third and fourth and karting graduate Hector Hurst (Lymington, Hampshire) was fifth for local Loughborough-based squad Scorpio Motorsport, ahead of Durrant. In the round two session, Thorp lapped almost 0.3 seconds quicker than Zamparelli to seize his maiden pole position with Hamilton third, Hurst a very impressive fourth and Hillspeed’s Howard Fuller (Kingston-upon-Thames) a promising fifth ahead of Vernon. Too much wheelspin at the beginning of round one immediately ruined Zamparelli’s hopes of victory and instead it was Thorp who moved into the lead on the run through Redgate. Just behind though, Webster made a sensational getaway from the second row and after latching on to Thorp’s tail he made his way past for the lead through Craner Curves with a stunning move. Zamparelli slipped to third but that then became fourth out of the Old Hairpin when Durrant sliced past with a great turn of speed. Fuller’s race came to an early conclusion when he was tipped off the circuit following contact with Hamilton at Schwantz Curve – although the latter held on to fifth. Webster managed to shake off the attentions of Thorp from lap five onward and he reeled off a string of extremely quick laps to establish a lead of 1.4 seconds by mid-distance. Zamparelli, who appeared to struggle for pace early on, suddenly found some speed and after setting the fastest lap of the race on the sixth tour he started to challenge Hamilton who had passed him on lap four. Retaking fourth on lap seven, Zamparelli set about closing down Durrant and although applying huge pressure the RPD driver was more than a match and retained his composure brilliantly. Hamilton was in an equally close scrap with Hurst in the battle for fifth and on lap 12 the rookie got by. Back at the front, Webster charged on relentlessly to take his first full-season victory and in doing so also posted the fastest lap of 1m08.169 seconds (104.51mph). Thorp was second, clear of Durrant whose stellar defence of third delivered a deserved maiden podium. Zamparelli was a frustrated fourth ahead of Hurst, Hamilton, Hillspeed’s Zaamin Jaffer (Cardiff) and Nottingham’s Matt Mason. Thorp made a superb start to round two and, much like Webster in the opener, took immediate control as the pack behind jostled for position. Hurst made a jump-start from the second row and, although he did realise his error and stood on the brakes, he received a drive-through penalty. again, Zamparelli just wasn’t able to compete during the early laps with Hamilton moving up to second, Vernon taking third – after an excellent first lap from sixth on the grid – and the Antel driver slipping to fourth ahead of Webster and Fuller. At the end of lap two, Webster produced a great move at the chicane to unseat Zamparelli from fourth place but moments later a multi-car collision at Redgate resulted in the appearance of the Safety Car. Frustratingly for Thorp his two second-plus lead was eroded but at the re-start on lap six he got away well and was never challenged on his way to a 1.3 second victory over the ever-improving Vernon. After dispatching Hamilton on lap 13 at Redgate with a bold, late move up the inside, he went on to finish four seconds clear of his team-mate. Zamparelli passed Webster for fourth around the outside at Redgate on lap seven and did look an increasing threat for the podium. However, an attempted repeat of the move on lap 14, as he tried to displace Hamilton, led to contact on the exit and an unfortunate spin. He ended the race eighth but with the consolation of a new lap record, 1m07.848 seconds (105.00mph). Hamilton held on to third for his first podium of the year, fractions ahead of the charging Durrant who managed to see-off Fuller for fourth. 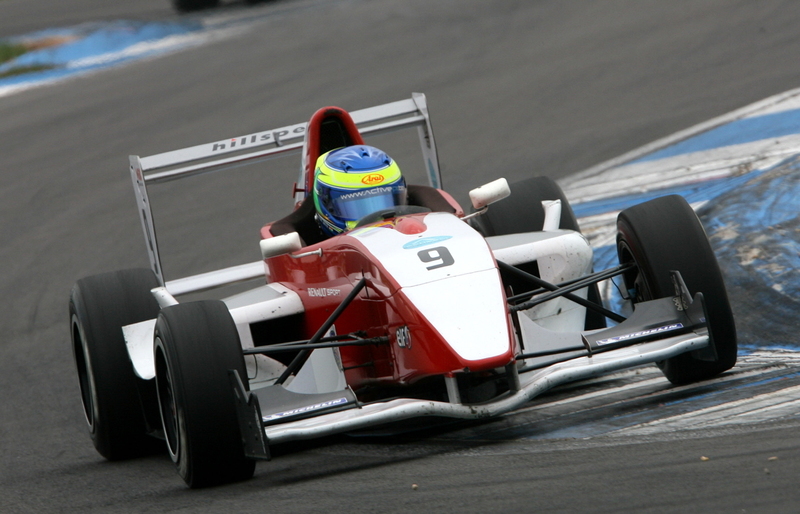 Spaniard Victor Jiminez took sixth for Fortec while local team MGR Motorsport netted a best finish of the weekend of seventh with David Wagner (Glasgow). Webster’s hopes, meanwhile, ended on lap 12 when his car cut-out through Hollywood. Rounds three and four of the 2011 season will take place three weeks from now, over the weekend 14th/15th May, at Brands Hatch Indy Circuit in Kent.